Why Does Trinity Have a High Caribbean Med School Ranking? One of the most common things prospective applicants look for when researching offshore medical schools is either, "What are the top Caribbean medical schools?" or, "What are the top ranking Caribbean medical schools?" While it makes sense to look for an objective assessment of the options as a starting point, certain complications arise in regards to these topics. The US and Canada have a number of internal rankings from trusted publications out there that provide great, useful school data for students and their families—and unfortunately, this just doesn’t exist for Caribbean medical schools. There are certainly amateur blogs and editorials that can be found on this topic, but it is important to note that nothing is considered "official." While there is no trusted or official ranking system by which to list our competitors and colleagues, below is a quick overview of what is important to look for when considering a Caribbean medical school. Are They an Accredited Medical School? When looking for an offshore med school, make sure to consider med schools that are accredited by an internationally recognized body—in the Caribbean, that’s CAAM-HP. That’s just the beginning, though. In the US, that school’s specific accreditation should be recognized by the NCFMEA (National Committee on Foreign Medical Education and Accreditation). It’s also important to look for WFME recognition, a FAIMER/IMED listing, and ECFMG authorization—all of which can be found at the top schools. Do They Have Individual State Approvals? Trinity’s graduates have already secured residencies and fellowships, and practice medicine throughout the US and Canada. That said, there are also individual state approvals, with Texas, New York, Florida, and California as a common touchstone because so many other states follow California’s decision without performing their own evaluation. There are already Trinity students in residency or licensed in New York, Florida, and Texas. Trinity’s California’s state approval goes live on January 1st, 2020. Similarly, when Trinity graduates have matched into states that historically follow California’s approval decisions, these states (Indiana and Idaho, for example) independently evaluated Trinity and opted to approve us themselves ahead of California. Idaho even granted Trinity a permanent exemption to its fifteen year rule because of the quality of our program and graduates. Note: Per the California medical board, because Trinity was never disapproved by California, only unevaluated, even students that start at Trinity before that approval is complete can practice in California afterwards. All it takes is 4 years of licensed medical practice in good standing for those students that earned their degree with us prior to the approval finalizing. What Are Their Match Rates & Attrition? Beyond accreditation and approvals, most applicants already know what else to consider, and match rate is a big one. Trinity’s residency match rate for graduates with U.S.citizenship is 84%. Our rate for Canadian citizen matching in both Canada and the U.S. is above 80%. At Trinity, we do not "gate" our published numbers based on test scores, nor do we throw the door wide and let everyone sink or swim. Rather, we strive to select candidates that have been overlooked by the United States and Canadian medical school systems and give them a supportive environment to thrive and achieve. Student success is our success, which is why we keep our classes so small and why our attrition rate is so low. From the first day of class in the first term of basic sciences through graduation, our attrition rate is 12-13%. Another point of interest is student board scores. Trinity is proud to note that our USMLE Step-1 pass rate is 93% with an average score of 223. Our Step-2 average score is 234 (both continue to climb, as well). As a final note, Trinity has an unbroken streak of recognizing multiple chief residents from every graduating class since our charter class graduated. While most medical schools can boast this, few are producing students so recognized by their peers and directors from a January class with only 25 students. 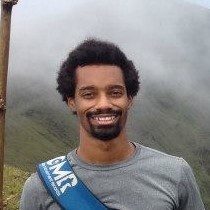 One thing applicants may overlook when considering a top Caribbean medical school is the location of, and number of times they’ll have to move, clinical rotations. There are Caribbean medical schools that spread their clinicals across the US, requiring students to move upwards of thousands of miles every eight weeks to finish their education. 100% of Trinity’s core clinical rotations now take place at our program in Baltimore, Maryland. 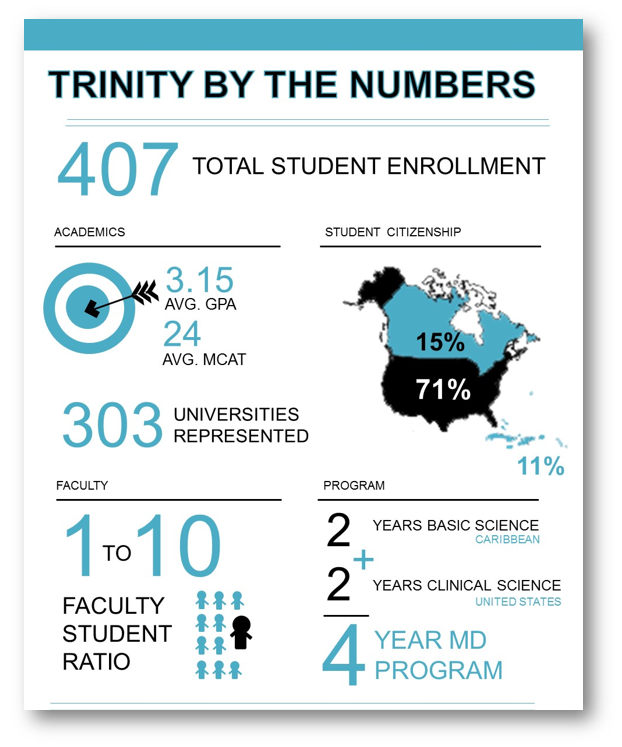 There are numerous offshore options available to any future medical student, and while Trinity School of Medicine is only one of them, it has many student advantages. Trinity’s students and their outcomes agree, too. If there’s one thing we ultimately want applicants to consider when deciding on a top Caribbean medical school, it’s this: what environment do you want to spend your medical education learning in? Trinity represents small class sizes, a supportive culture, constant bedside experience, unparalleled access to global health outreach, a unified clinical program in one US city, and most importantly—strong outcomes. Trinity teaches you the academic material, but you also learn how to take that knowledge, connect appropriately with patients, and give a great physical. We learn how to be clinicians during the basic sciences from day one. It's a great experience.